6th September. Posted in News. Hamilton Adhesive Labels, a leading manufacturer of multi-colour labels for the food and drink, industrial, household and personal care sectors, is now able to incorporate eye-catching, premium effect pigments into its printing to offer brand owners stand-out, creative packaging. 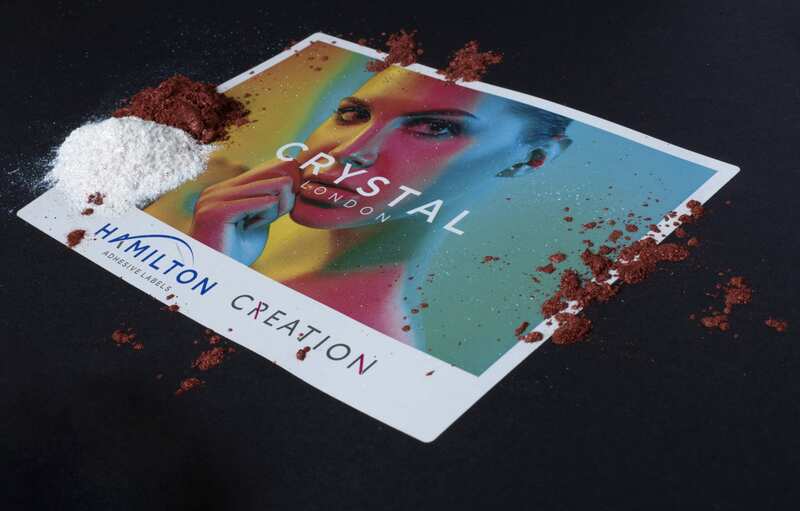 Ideal for luxury cosmetic, alcohol, confectionery and personal care brands, the multi-dimensional effect pigments enable Hamilton to deliver a completely bespoke appearance label. From a subtle shimmer to glittery sparkle, the pigments can create a unique tactile design feature or replicate products in print – make-up, for example. The pigments will support brands drive product sales through enhanced shelf presence in a crowded and competitive retail landscape. Paul Larkin, Operations Director at Hamilton Adhesive Labels, said: “These special effect pigments take brand communication and identity to new heights, bringing a novel, sensory experience to the consumer thanks to a label that has a completely unique finish. “Providing iridescence and movement in changing light, labels containing the pigments will wow the consumer and allow a brand to stand out from others on the shelf. With brilliant depth of colour, the pigments give a striking appearance to any pack. Hamilton’s cutting-edge technology has been recognised for a top industry award. Its Crystal London Psychedelic Print label is shortlisted in the promotional print category at the prestigious FlexoTech Awards, held in October.